Trauma can do that to a person, or so I have been told. I know that it is ok to take a break, to explore things I normally would not do.. so that is what I have been doing. I am teaching an oil class on classical realism. Learning and teaching about glazing like Caravaggio. I bought some new pastels, (I will show ya those next week!) and I have started a series of nocturnal oil paintings that I am doing in my kitchen. See, when I recently moved, it was to a really cool little town that has older houses and sidewalks and the best electrical wires and lights out in the streets. Late at night I have sat on my bed and looked out at these really cool abstracted scenes of wires and lights and cars and slightly tired garages. In my kitchen, when the dusk is setting I become enchanted by these elements as I do the dishes. 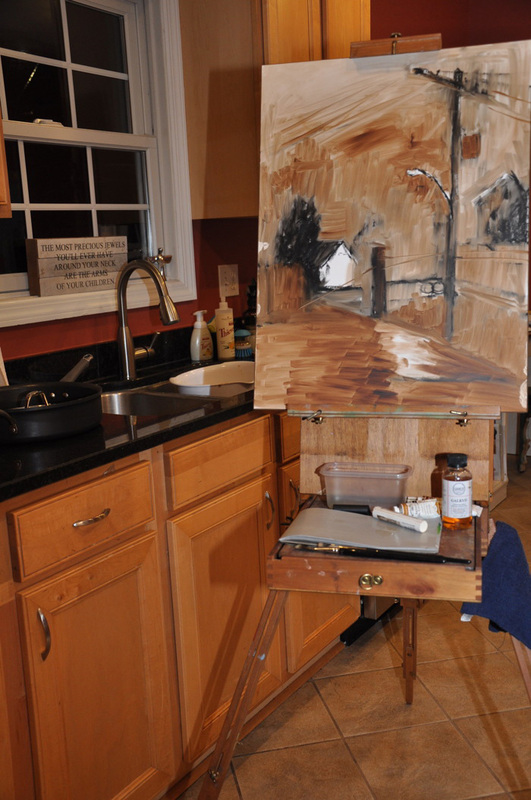 So naturally, I had to set up my easel at the kitchen sink. Do I know what I am doing? Not really. I came across some Shiva oil sticks in my move and I think I must have bought them over 12 years ago. It just felt like I should give them a go. I find they are a nice cross between oils and pastel sticks since they are sticks of oil paint. I can hit the marks with mineral spirits and then they dissolve like a watercolor. Yum… all of my favorite things. So I am painting at my kitchen sink – as soon as the sun goes down I ignore the dishes and leftovers from dinner and find myself playing with washes of oils and marking out a “primer” layer. It feels fun, but it also feels a little wicked. Most know me as a pastel painter after all, but I guess the operative word here is painter. I can change. I can evolve, I can lose some leaves and draw down and see what is in my undiscovered roots. And right now I am looking for new paths, new connections and new stories to paint. Oh, the portraits will never go away. 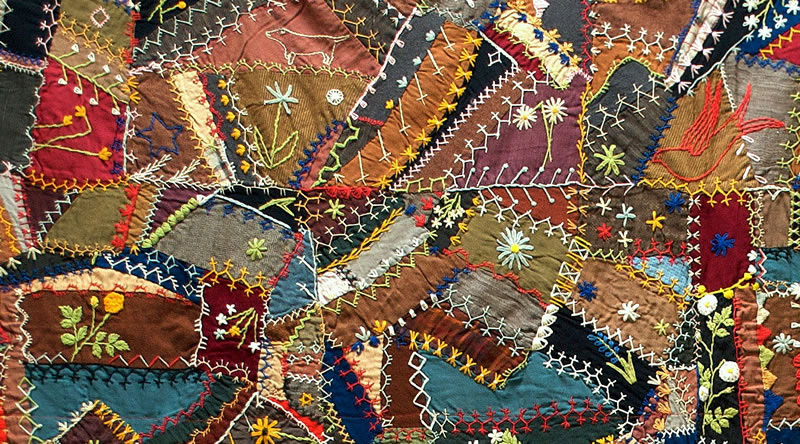 Neither will the pastels, but I have always loved crazy quilts and right now I need to stitch a bunch of crazy things together. In the end it will all come out beautifully whole. So will I. So glad your feeling positive your feeling positive. it is nice to see. I have a real problem with that. I give you a lot of credit for evolving to this way of thinking. I’m still in the mindset that work must be done before play even if it’s not truly playing. It’s hard to get past but another day..,, also jealous you found a nocturnal scene. Been tempted by others works but never seem to find a spot. How do they work in the dark? not easily….I set up a light in the kitchen tilted away from the easel and very away form the window….sorta works…I think work and play need to be the same…. I have been doing some nocturnal paintings too. It is a fascinating time of day…oops night. Oils are tough for me because they don’t dry quickly. I can make a lot of mud, so I just keep away from them. I’m so used to painting icons in acrylic; I love them. I love colored pencils too. Two and a half weeks ago I took an egg tempera class. The teacher, Kelly Radding was fantastic. I had taken an egg tempera class, perhaps ten or eleven years ago that was very unsatisfactory for me. I’ve alway wanted to use egg tempera like Andrew Wyeth and Kelly did the trick. It’s like painting with smoke. It’s wonderful. Acrylics can be handled similarly, but don’t quite have the luminescence of egg tempera. Christine, I hope time is helping you to get on with your life since your divorce. I am good truly! crazy things still happening, but I will be ok and free someday….